Rain water percolates through the solid waste stored in a landfill dragging suspended solids, dissolved salts, organic matter and other contaminants. Leachate is temporarily stored in lagoons until it is removed for subsequent treatment (vacuum evaporation, ultrafiltration, crystallization, reverse osmosis, etc.). The problems associated with open lagoons (increased volumes to manage after rainfall and dispersion of odours) can be solved by installing FLOATEC® floating covers. The cover stops rainwater from entering the lagoon and avoids odour release. 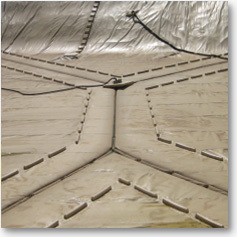 The floating cover is adapted to channel and extract the gases that accumulate under the deck, which will then be treated, typically by filtration through activated carbon.